This book compiles the best evidence in procedural dermatology, including skin cancer surgery, laser techniques, minimally invasive cosmetic surgery, and emerging techniques. Building on the highly successful first edition, this volume provides much expanded coverage of a range of topics. The best information is provided to reveal the most appropriate interventions for particular indications, optimal treatment techniques, and strategies for avoiding adverse events. 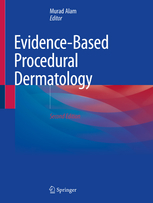 Evidence-Based Procedural Dermatology, 2nd edition, includes two types of chapters: procedures and indications. Each chapter is designed to be clear and concise, with tables and flowcharts to showcase main findings. Each cited study is tagged with a level of evidence, and every recommendation includes a strength of evidence score. More than double the length of the first edition, this newest edition includes added procedures and interventions like: new lasers and energy devices for skin resurfacing and pigmentation; non-invasive fat reduction and skin tightening using cryolipolysis, radiofrequency, ultrasound, and chemical adipocytolysis; specific post-skin cancer excision reconstruction techniques; and novel approaches for melanoma.